I visit Santa Cruz, CA occasionally on the weekend when I need a break from Silicon Valley. For those of you who have spent time there, you know what I mean. 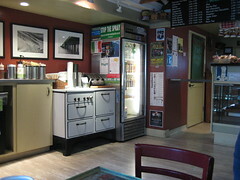 Each time I am in the area, I go out of my way to visit the Grinds Coffee & Tea House in Capitola. Sure, I could just as easily hit Starbucks. There are at least five in that area. But, I don’t. Why? Because I’m in Santa Cruz and Santa Cruz has a very specific culture and context. Grinds is a Santa Cruz experience. It is a bit quirky with the bright green exterior, but very authentic, unique, and pleasant inside. It is a treat to go there and get whatever coffee you want made fresh by the cup. Grinds is a differentiated experience and it certainly fits the Santa Cruz context. Yes, there are economies of scale in providing the same menu and even interior decorating when you are a global business. And, yes, you will attract customers who want “the comfort of the same.” But, increasingly, consumers are starting to tire of the McDonald’s-Walmart-Starbucks effect and want to experience something unique, something new, something with “local flavor.” Sites like Etsy are yet more proof that the pendulum is starting to swing back.